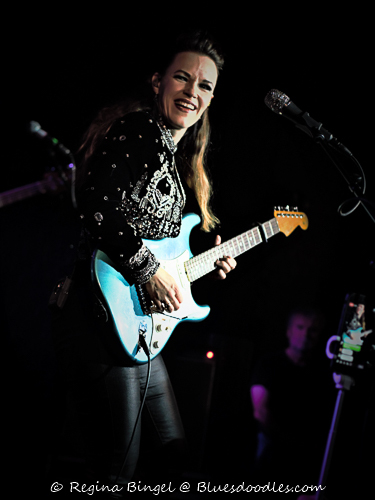 Tuesday Blues day, and I was out to see Erja Lyytinen from Helsinki playing at the Borderline. I was very excited for one reason, I have never seen her play live. She’s a household name within the Scandinavian Blues scene and supported such names like Walter Trout, Carlos Santana or John Mayall. With her brand new single and the latest album “Stolen Hearts” at Tuohi Records in her suitcase, she travelled to London to kick off the European tour 2018/2019 at the Borderline on Tuesday 6th. The gig would have been a great opportunity for another live album like “Live in London” from 2015. The atmosphere was thrilling and her fans were in anticipation of her arrival. I was curious about Erja and her music and definitely in need for some serious Blues-rock. The evening started very promising with the fantastic guitar driven “Lovers Novel” and I knew I wouldn’t be disappointed at all. I really enjoyed it right from the beginning. I do love blues-rock and especially when it starts with a dramatic guitar solo. “Black Ocean” was next with its brightening beat in a perfect combination between Erja’s dark and jamming voice and the rhythm section of bass and drums. It felt like the natural beating flow of a heart. The sound of her guitar is unique and if this rhythm is not getting you then, I am very sorry, you truly have no blood but sheer water in your veins. After “Everything’s Fine” came “Another World” the brand new single which was released on October 5th (listen below) and the audience liked it a lot. The mixture of the clear guitar sound and the dusky, down to earth lyrics merged wonderfully and truly felt nurtured, like the song said, and filled you up with a more calm and peaceful state of mind. “Slowly burns! …“ can you feel my pain” Erja asked the crowd and then started bringing down her improvisation. “Stolen Hearts” the title track from her latest album and it is made to sing along. I still have the melody in my head so I can be delighted that my next working week will be lifted up by Erja and her music. And when have you last been at a solid Blues gig and witnessed enthusiast’s headbanging to the blues? All the cats who made it down to the Borderline on Tuesday had huge fun and a good time with the fantastic music. So the Blues is coming back free and easy in style with a new generation of both musicians and fans. What came next was made for me, yes! “Do you like Sun House?” “Do you like Muddy Waters… what about Robert Johnson?” She called it Erja’s Delta mix and it was a superb little set of Delta Blues improvisations of Sun House, Muddy Waters, Robert Johnson and I don’t know what it is, but the sliding guitar sound goes down like Whiskey and it always gets me and my fellow audience colleagues too! For my point I can only say Finnish Delta Blues is alive and rocks the fjords. .. “and how about this girl from Helsinki?” In this sense, I have absolutely nothing against a takeover. What I enjoyed most was the eclectic improvisations with their natural flowing sound as if she was talking with her guitar. You listened to the solos starting and felt what it was about. This is how music should be! Feeling instead of reasoning is much more important and the harvest is coming into the soul through the music you’re listening to. The cherry on top of the huge Ice cream for me and for all who were there was a real treat; Jimi Hendrix Crosstown Traffic! I love Jimi’s music and I am always happy when I hear a song like “All Along The Watchtower” or “Crosstown Traffic”. I remember sitting at home as a child and listening to this song for the first time… Most of all this memory is leaving a big smile on my face. I am sure he was looking down on us as well and smiled too. If you missed it there is another chance to see Erja again in London and that is on the 26th March 2019. A very big announcement was made on stage that night! Erja is going to record another album in 2019 and you all can take part make it happen by joining the crowdfunding campaign which will be starting soon. The fans at the Borderline were very enthusiastic. And isn’t it great to be able to help another album come to life with fantastic bluesy, rocky songs from one of Scandinavia’s most prominent Blues-rock guitarists? By doing so you are helping an award-winning artist capture her sound for you to listen again and again. I know where I am on the 26th of March 2019. I hope to see you there too.